Pioneering research has been carried out over the last decade on mentalization and the promotion of mentalizing capacity - the ability to interpret the behavior of oneself and others as based on intentional mental states, such as needs, desires, feelings, and beliefs. This book is a consolidation of current knowledge and clinical applications, bringing together a group of international experts who have been on the ground floor of theory and research to clarify the concept, review pertinent neurobiological and psychosocial research, and explore its diverse clinical applications. Four sections will cover Conceptual Foundations, Developmental Psychopathology, Intervention and Prevention. A biopsychosocial approach will be used, integrating new research in neuroimaging with psychodynamic and cognitive perspectives. Clinical issues covered will include parent–child interactions, personality disorders, traumatic brain injury, bullying and at-risk children. Peter is Director of the Sub-Department of Clinical Health Psychology, University College London; and Adjunct Professor of Psychiatry, Menninger Department of Psychiatry and Behavioral Sciences at the Baylor College of Medicine. His ideas were central to developing mentalization as a concept, he has also catalyzed research and pioneered the application of mentalization to clinical practice. Foreword by Susan W. Coates. Preface by Jon G. Allen and Peter Fonagy. PART I: CONCEPTUAL AND CLINICAL FOUNDATIONS. 1. Mentalizing in Practice (Jon G. Allen). 2. Mentalizing from a Psychoanalytic Perspective: What’s New? (Jeremy Holmes). 3. The Mentalization-Focused Approach to Social Development (Peter Fonagy). 4. Mentalizing Problems in Childhood Disorders (Carla Sharp). 5. A Neurobiological Perspective on Mentalizing and Internal Object Relations in Traumatized Patients with Borderline Personality Disorder (Glen O. Gabbard, Lisa A. Miller and Melissa Martinez). PART III: INCORPORATING MENTALIZING IN ESTABLISHED TREATMENTS. 6. 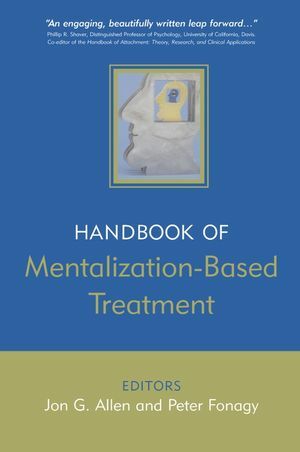 Integrating Mentalization-Based Treatment and Traditional Psychotherapy to Cultivate Common Ground and Promote Agency (Richard L. Munich). 7. Cognitive Behavioral Therapy Promotes Mentalizing (Thröstur Björgvinsson and John Hart). 8. Enhancing Mentalizing Capacity through Dialectical Behavior Therapy Skills Training and Positive Psychology (Lisa Lewis). 9. Mentalizing and Borderline Personality Disorder (Anthony Bateman and Peter Fonagy). 10. Short-Term Mentalization and Relational Therapy (SMART): An Integrative Family Therapy for Children and Adolescents (Pasco Fearon, Mary Target, Peter Fonagy, Laurel L. Williams, Jacqueline McGregor, John Sargent and Efrain Bleiberg). 11. Training Psychiatry Residents in Mentalization-Based Therapy (Laurel L.Williams, Peter Fonagy, Mary Target, Pasco Fearon, John Sargent, Efrain Bleiberg and Jacqueline McGregor). 12. Treating Professionals in Crisis: A Mentalization-Based Specialized Inpatient Program (Efrain Bleiberg). 13. Enhancing Mentalizing through Psycho-Education (G. Tobias G. Haslam-Hopwood, Jon G. Allen, April Stein and Efrain Bleiberg). 14. Minding the Baby: A Mentalization-Based Parenting Program (Lois S. Sadler, Arietta Slade and Linda C. Mayes). 15. Transforming Violent Social Systems into Non-Violent Mentalizing Systems: An Experiment in Schools (Stuart W. Twemlow and Peter Fonagy). 16. Does Mentalizing Promote Resilience? (Helen Stein).